12 Watt LED Nail Lamp. 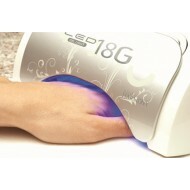 This powerful 12 Watt LED lamp by GlazeMe will cure all LED U..
2.5 Watt LED Nail Lamp. This 2.5 Watt LED lamp by GlazeMe will cure all LED UV activ..
3 Watt LED Nail Lamp. This 3 Watt LED lamp by GlazeMe will cure all LED UV activated..
54 Watt LED Nail Lamp. This powerful 54 Watt LED lamp by GlazeMe will cure all LED U..
6 Watt LED Nail Lamp. This 6 Watt LED lamp by GlazeMe will cure all LED UV activated..